These highlights do not include all the information needed to use BabyBIG, [Botulism Immune Globulin Intravenous (Human)], safely and effectively. See full prescribing information for BabyBIG. Treatment of infant botulism caused by toxin types A or B in patients below one year of age (1). Recommended dose is 1.0 mL/kg (50 mg/kg) given as a single intravenous infusion (2). Reconstitute in 2 mL Sterile Water for Injection USP and initiate infusion within 2 hours of reconstitution (2.1). Administer BabyBIG through a separate intravenous line (2.3). Begin infusion slowly (0.5 mL/kg/h); if no untoward reaction in 15 minutes, increase rate to 1.0 mL/kg/h (2.2, 2.3). DO NOT EXCEED THE RECOMMENDED DOSE, CONCENTRATION, AND RATE OF INFUSION (2.3). Assess renal function prior to and following administration (5.1, 5.2). Anaphylaxis and hypersensitivity reactions may occur (5.4). This risk should be considered when an IgA-deficient patient is to receive subsequent administration of blood products containing IgA after previous treatment with BabyBIG (4). Hyperproteinemia, increased serum viscosity and hyponatremia may occur in patients receiving immune globulin intravenous (human) (IGIV) therapy (5.6). Thrombotic events have occurred in patients receiving IGIV products. Monitor patients with known risk factors for thrombotic events; consider baseline assessment of blood viscosity for those at risk of hyperviscosity (5.7). Hemolytic anemia can develop subsequent to IGIV therapy due to enhanced RBC sequestration (5.8). IGIV recipients should be monitored for pulmonary adverse reactions, such as Transfusion-Related Acute Lung Injury (TRALI) (5.9). Aseptic meningitis syndrome (AMS) has been reported with other IGIV treatment, especially with high doses or rapid infusion (5.5). The product is made from human plasma and may contain infectious agents, e.g. viruses and, theoretically, the Creutzfeldt-Jakob disease agent (5.3). The most common adverse reaction occurring in at least 5% of the patients treated with BabyBIG in a controlled clinical study was mild and transient erythematous rash of the face or trunk (6.1). To report SUSPECTED ADVERSE REACTIONS, contact the California Department of Public Health at 1-510-231-7600 and http://www.infantbotulism.org/ or FDA at 1-800-FDA-1088 or www.fda.gov/medwatch. The passive transfer of antibodies may interfere with the response to live viral vaccines (7). 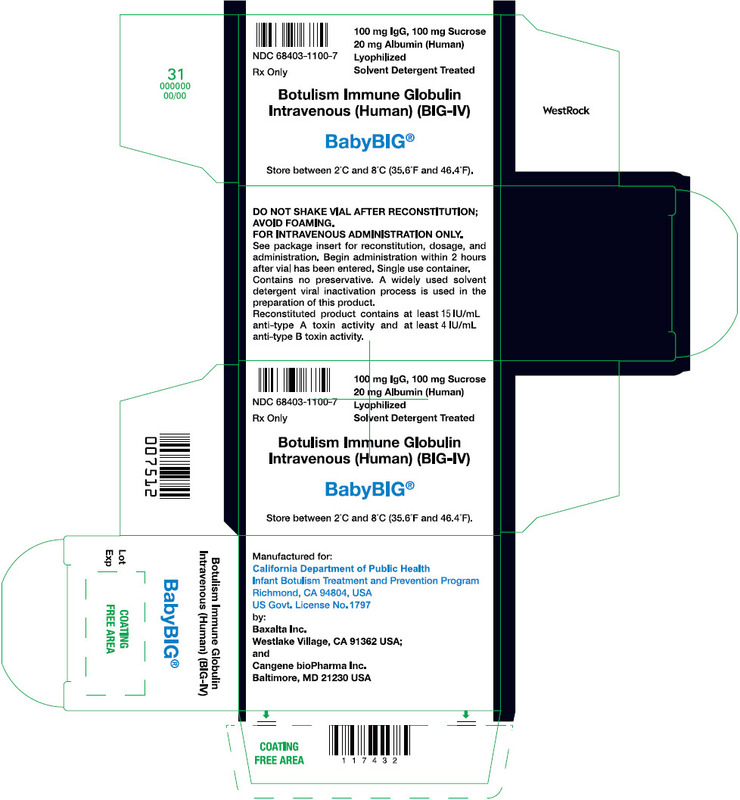 BabyBIG®, Botulism Immune Globulin Intravenous (Human), is indicated for the treatment of infant botulism caused by toxin type A or B in patients below one year of age. BabyBIG does not contain a preservative. After reconstitution of the lyophilized product, the vial should be entered only once for the purpose of administration, and the infusion should begin within 2 hours of reconstitution. Remove the tab portion of the vial cap and clean the rubber stopper with 70% alcohol or equivalent. Reconstitute the lyophilized powder with 2 mL of Sterile Water for Injection USP, to obtain a 50 mg/mL BabyBIG solution. A double-ended transfer needle or large syringe is suitable for adding the water for reconstitution. When using a double-ended transfer needle, insert one end first into the vial of water. The lyophilized powder is supplied in an evacuated vial; therefore, the water should transfer by suction (the jet of water should be aimed to the side of the vial). After the water is transferred into the evacuated vial, the residual vacuum should be released to hasten the dissolution. Rotate the container gently to wet all the powder. An approximately 30-minute interval should be allowed for dissolving the powder. DO NOT SHAKE THE VIAL, AS THIS WILL CAUSE FOAMING. Inspect BabyBIG visually for particulate matter and discoloration prior to administration. Infuse the solution only if it is colorless, free of particulate matter, and not turbid [see WARNINGS AND PRECAUTIONS (5)]. To prevent the transmission of hepatitis viruses or other infectious agents from one person to another, use sterile disposable syringes and needles. Never reuse syringes and needles. The recommended total dosage of BabyBIG is 1.0 mL/kg (50 mg/kg), given as a single intravenous infusion as soon as the clinical diagnosis of infant botulism is made. BabyBIG should be used with caution in patients with pre-existing renal insufficiency and in patients judged to be at increased risk of developing renal insufficiency (including, but not limited to, those with diabetes mellitus, volume depletion, paraproteinemia, sepsis, or who are receiving known nephrotoxic drugs) [see WARNINGS AND PRECAUTIONS (5.1)]. Do not pre-dilute BabyBIG before infusion. Begin infusion within 2 hours after reconstitution is complete and conclude within 4 hours of reconstitution, unless infusion is temporarily interrupted for adverse reaction. Monitor vital signs continuously during infusion. Administer BabyBIG intravenously using low volume tubing and a constant infusion pump (i.e., an IVAC pump or equivalent) through a separate intravenous line. If a separate line is not possible, it may be "piggybacked" into a pre-existing line if that line contains either Sodium Chloride Injection USP, or one of the following dextrose solutions (with or without NaCl added): 2.5% dextrose in water, 5% dextrose in water, 10% dextrose in water, or 20% dextrose in water. If a pre-existing line must be used, do not dilute BabyBIG more than 1:2 with any of the above-named solutions. Admixtures of BabyBIG with any other solutions have not been evaluated. Use an in-line or syringe-tip sterile, disposable filter (18 μm) for the administration of BabyBIG. In the absence of prospective data allowing identification of the maximum safe dose, concentration, and rate of infusion in these patients, DO NOT EXCEED THE RECOMMENDED DOSE, CONCENTRATION, AND RATE OF INFUSION. Begin infusion slowly. Administer BabyBIG intravenously at 0.5 mL per kg body weight per hour (25 mg/kg/h). If no untoward reactions occur after 15 minutes, the rate may be increased to 1.0 mL/kg/h (50 mg/kg/h). DO NOT EXCEED THIS RATE OF ADMINISTRATION. Monitor the patient closely during and after each rate change [see WARNINGS AND PRECAUTIONS (5.1)]. At the recommended rates, infusion of the indicated dose should take 97.5 minutes total elapsed time. As adverse reactions experienced by patients treated with immune globulin intravenous (human) (IGIV) products have been related to the infusion rate, if the patient develops a minor side effect (i.e., flushing), slow the rate of infusion or temporarily interrupt the infusion. If anaphylaxis or a significant drop in blood pressure occurs, discontinue the infusion and administer epinephrine. Individuals with selective immunoglobulin A deficiency have the potential for developing antibodies to immunoglobulin A and could have anaphylactic reactions to the subsequent administration of blood products that contain immunoglobulin A. Only administer BabyBIG as an intravenous infusion, since other routes of administration have not been evaluated. Do not use BabyBIG if the reconstituted solution is turbid [see DOSAGE AND ADMINISTRATION (2.1)]. Patients should be well hydrated prior to the initiation of the BabyBIG infusion. Assess renal function, including the measurement of blood urea nitrogen (BUN) or serum creatinine prior to the initial infusion of BabyBIG [see DOSAGE AND ADMINISTRATION (2)]. Periodic monitoring of renal function tests and urine output is particularly important in patients judged to have a potential risk for developing acute renal failure. [1-4] Increases in serum creatinine and BUN have been observed as soon as one to two days following treatment with other IGIV products. During administration, monitor the patient's vital signs continuously and observe the patient carefully for any associated symptoms. DO NOT EXCEED THE RECOMMENDED INFUSION RATE of 1 mL/kg/hour (50 mg/kg/h), and follow the infusion schedule closely [see DOSAGE AND ADMINISTRATION (2.3)]. If a patient develops an infusion reaction, slow the rate of infusion immediately or temporarily interrupt the infusion. Other IGIV products have been reported to be associated with renal dysfunction, acute renal failure, osmotic nephrosis, and death. [5-6] While these reports of renal dysfunction and acute renal failure have been associated with the use of many licensed IGIV products, those that contained sucrose as a stabilizer and were administered at daily doses of 400 mg/kg or greater have accounted for a disproportionate share of the total number. BabyBIG contains sucrose as a stabilizer. Patients predisposed to acute renal failure include those patients with any degree of pre-existing renal insufficiency, diabetes mellitus, volume depletion, sepsis, paraproteinemia, or who are receiving known nephrotoxic drugs. Especially in such patients, BabyBIG should be administered at the minimum concentration available and at the minimum rate of infusion practicable. BabyBIG is made from human plasma and, like other plasma products, carries the possibility for transmission of blood-borne viral agents and, theoretically, the Creutzfeldt-Jakob disease agent. The risk of transmission of recognized blood-borne viruses has been reduced by screening plasma donors for prior exposure to certain viruses, for the presence of certain viral infections, and by the viral inactivation and/or removal properties of the precipitation procedures used for the purification of BabyBIG [see DESCRIPTION (11)]. Despite these measures, some as yet unrecognized blood-borne infectious agents may not be inactivated by the manufacturing process; therefore, BabyBIG, like any other blood product, should be given only if a benefit is expected [see PATIENT COUNSELING INFORMATION (17)]. Although acute systemic allergic reactions were not seen in clinical trials with BabyBIG, epinephrine should be available for treatment of acute allergic symptoms [see ADVERSE REACTIONS (6.1)]. If hypotension or anaphylaxis occurs, discontinue the administration of BabyBIG immediately and give supportive care as needed. An aseptic meningitis syndrome (AMS) has been reported to occur infrequently in association with IGIV administration. [10-13] The syndrome usually begins within several hours to two days following IGIV treatment. It is characterized by symptoms and signs that include the following: severe headache, nuchal rigidity, drowsiness, fever, photophobia, painful eye movements, and nausea and vomiting. Cerebrospinal fluid studies are frequently positive with pleocytosis up to several thousand cells per cubic millimeter, predominately from the granulocytic series, and with elevated protein levels up to several hundred mg/dL. Conduct a thorough neurological examination in patients exhibiting such symptoms and signs to rule out other causes of meningitis. [10-13] AMS may occur more frequently in association with high total doses (2 g/kg) of IGIV treatment. Discontinuation of IGIV treatment has resulted in remission of AMS within several days without sequelae. AMS was not observed in clinical trials of BabyBIG. Hyperproteinemia, hyponatremia, and increased serum viscosity have been observed following administration of IGIV products. It is clinically critical to distinguish true hyponatremia from pseudohyponatremia caused by decreased calculated serum osmolality or elevated osmolar gap, because treatment aimed at decreasing serum free water in patients with pseudohyponatremia may lead to volume depletion, a further increase in serum viscosity and a higher risk of thromboembolic events. These adverse events have not been observed with BabyBIG. Thrombotic events may occur following IGIV treatment. Patients at risk may include those with a history of atherosclerosis, multiple cardiovascular risk factors, advanced age, impaired cardiac output, coagulation disorders, prolonged periods of immobilization, and/or known or suspected hyperviscosity. Consider baseline assessment of blood viscosity in patients at risk for hyperviscosity, including those with cryoglobulins, fasting chylomicronemia/markedly high triacylglycerols (triglycerides), or monoclonal gammopathies. For patients judged to be at risk of developing thrombotic events, administer BabyBIG at the minimum rate of infusion practicable. IGIV products may contain blood group antibodies, which can act as hemolysins and induce in vivo coating of red blood cells with immunoglobulin, causing a positive direct antiglobulin reaction and, rarely, hemolysis. Hemolytic anemia may develop subsequent to IGIV therapy due to enhanced red blood cell sequestration. Monitor patients for clinical signs and symptoms of hemolysis. If these are present after BabyBIG infusion, perform appropriate confirmatory laboratory testing. Non-cardiogenic pulmonary edema may occur in patients following IGIV treatment. TRALI is characterized by severe respiratory distress, pulmonary edema, hypoxemia, normal left ventricular function, and fever. Symptoms typically occur within 1 to 6 hours following treatment [See PATIENT COUNSELING INFORMATION (17)]. Monitor patients for pulmonary adverse reactions. If TRALI is suspected, perform appropriate tests for the presence of anti-neutrophil antibodies in both the product and patient serum. Serious adverse reactions were not observed in clinical trials using BabyBIG. The most common adverse reaction observed with BabyBIG treatment during clinical trials (>5%) was skin rash. Other reactions such as chills, muscle cramps, back pain, fever, nausea, vomiting, and wheezing were the most frequent adverse reactions observed during the clinical trials of similarly-prepared human IGIV products. The incidence of these reactions was less than 5% of all infusions in BabyBIG clinical trials, and these reactions were most often related to infusion rates. Two clinical studies of BabyBIG were performed: (1) an adequate and well-controlled study to evaluate safety and efficacy of BabyBIG, which used BabyBIG Lot 1, and (2) an open label study to collect additional safety data and confirm efficacy, which used BabyBIG Lot 2 [see Clinical Studies (14)]. [14,15] Different methodologies were used to collect adverse events in the controlled study and open label study. Minor clinical events that were not recorded as adverse events in the controlled study were recorded as adverse events in the open label study. The only adverse event considered possibly related to BabyBIG administration was a mild, transient erythematous rash of the face or trunk. The following table summarizes the occurrence of rash by day of study relative to day of treatment for the randomized, controlled clinical trial (RCT) and for the open label study (OLS). Both Gammagard 5% and Gammagard S/D 5% were used as placebo in this study. Day 0 is the day of treatment. In the controlled study, when only treatment emergent events are considered, 14% of the BabyBIG-treated patients experienced erythematous rash during or after study infusion. Eight percent of placebo-treated patients also experienced erythematous rash in this study. A similar rash is known to occur both in infant botulism patients who have not received any IGIV products and in patients treated with other IGIVs,[2,3] making it difficult to ascertain the causality of the rash. Adverse event coding was used in the open label study to distinguish between minor clinical events that required no intervention and more significant events that required intervention. For example, "increased blood pressure" or "decreased blood pressure" was assigned when transient changes in blood pressure were observed, whereas "hypertension" or "hypotension" was assigned when more prolonged or significant changes were observed. Experience with Other IGIV Products. Some classes of adverse reactions that have not been reported in BabyBIG clinical studies or postmarketing experience have been observed with the overall post-approval use of other IGIV products, as shown in the following table. Admixtures of BabyBIG with other drugs have not been evaluated. It is recommended that BabyBIG be administered separately from other drugs or medications that the patient may be receiving [see DOSAGE AND ADMINISTRATION (2)]. Antibodies present in immune globulin preparations may interfere with the immune response to live virus vaccines such as polio, measles, mumps, and rubella; THEREFORE, VACCINATION WITH LIVE VIRUS VACCINES SHOULD BE DEFERRED UNTIL APPROXIMATELY THREE OR MORE MONTHS AFTER ADMINISTRATION OF BabyBIG. If such vaccinations were given shortly before or after BabyBIG administration, revaccination may be necessary. BabyBIG has been studied for safety and efficacy only in patients below one year of age [see ADVERSE REACTIONS (6) and CLINICAL STUDIES (14)]. It has not been tested in other populations. Although limited data are available, clinical experience with other immunoglobulin preparations suggests that the major manifestations would be those related to volume overload. BabyBIG, Botulism Immune Globulin Intravenous (Human) (BIG-IV), is a solvent-detergent-treated, sterile, lyophilized powder of immunoglobulin G (IgG), stabilized with 5% sucrose and 1% albumin (human). It contains no preservative. The purified immunoglobulin is derived from pooled adult plasma from persons who were immunized with pentavalent botulinum toxoid and selected for their high titers of neutralizing antibody against botulinum neurotoxins type A and B. All donors were tested and their sera found to be negative for antibodies against the human immunodeficiency virus and the hepatitis B and hepatitis C viruses. These include Cohn/Oncley fractionation (Fraction I through Supernatant III Filtrate); nanofiltration through one 75-nm and two 35-nm filters; and solvent/detergent viral inactivation. These viral reduction steps have been validated in a series of in vitro experiments for their capacity to inactivate and/or remove Human Immunodeficiency Virus type 1 (HIV-1) and the following model viruses: bovine viral diarrhea virus (BVDV) as a model for hepatitis C virus; mouse encephalomyelitis virus (MEMV) as a model for hepatitis A virus; and pseudorabies virus (PRV), feline calicivirus (FCV), and Sindbis virus to cover a wide range of physicochemical properties in the model viruses studied. Total mean log10 reductions range from 4.63 to greater than 16 log10 as shown in the following table. Included hydrophobic chromatography after solvent/detergent treatment. Additional testing performed with bovine parvovirus (as a model for parvovirus B19) showed a mean cumulative reduction factor of greater than 7.34 log10 for Cohn/Oncley fractionation and solvent/detergent treatment followed by hydrophobic chromatography. A mean cumulative reduction factor of 2.55 log10 was observed for removal of porcine parvovirus by nanofiltration. When reconstituted with Sterile Water for Injection USP, each cubic centimeter (milliliter) contains approximately 50 ± 10 mg immunoglobulin, primarily IgG, and trace amounts of IgA and IgM; 50 mg sucrose; 10 mg albumin (human); and approximately 20 × 10-3 mEq sodium. The reconstituted solution should appear colorless and translucent [see DOSAGE AND ADMINISTRATION (2.1), WARNINGS AND PRECAUTIONS (5)]. BabyBIG contains antibodies specific for botulinum neurotoxin types A and B that bind to and neutralize circulating toxin types A and B in the patient. Formal studies on pharmacodynamics have not been conducted with BabyBIG. Traditional pharmacokinetic studies of BabyBIG have not been performed. However, the following table summarizes the mean serum titer of the anti-A component of BabyBIG following administration. NOTE: 1 IU of anti-type A or anti-type B antibody neutralizes, by definition, 104 mouse LD50 of botulinum toxin. Length of hospital stay was also analyzed by patient age in both the adequate and well-controlled study and in an open label study. The observed reduction in length of hospital stay was statistically significant (p<0.01) with the exception of the 0 to 60-day age stratum, where small patient numbers limited the statistical power. Both Gammagard 5% and Gammagard S/D 5 % were used as placebo in this study. Length of hospital stay was significantly reduced in both white and non-white patients (p=0.002). BabyBIG has not been tested for safety and efficacy in adults. Cytogam®, cytomegalovirus immune globulin intravenous (human) (CMV-IGIV). In: Physician's Desk Reference. 55th Ed. Montvale, New Jersey: Medical Economics Company, Inc.; 2001:1861-1863. Immune globulin intravenous (human) Iveegam En IGIV. In: Physician's Desk Reference. 55th Ed. Montvale, New Jersey: Medical Economics Company, Inc.; 2001:816-820. Immune globulin intravenous (human) (IGIV) Gammagard® S/D. In: Physician's Desk Reference. 55th Ed. Montvale, New Jersey: Medical Economics Company, Inc.; 2001:812-815. Immune globulin intravenous (human) Sandoglobulin® lyophilized preparation. In: Physician's Desk Reference. 55th Ed. Montvale, New Jersey: Medical Economics Company, Inc.; 2001:2210-2213. Perazella MA, Cayco AV. Acute renal failure and intravenous immune globulin: sucrose nephropathy in disguise? Am J Ther 1998; 5:399-403. Cayco AV, Perazella MA, Hayslett JP. Renal insufficiency after intravenous immune globulin therapy: a report of two cases and an analysis of the literature. J Am Soc Nephrol 1997; 8:1788-1793. Important Drug Warning ("Dear Doctor") letter. Center for Biologics Evaluation and Research, Food and Drug Administration, 1998. Denepoux S, et al. Molecular characterization of human IgG monoclonal antibodies specific for major birch pollen allergen Bet v 1. Anti-allergen IgG can enhance the anaphylactic reaction. FEBS Lett 2000; 465:39-46. Burks AW, Sampson HA, Buckley RH. Anaphylactic reactions after gamma globulin administration in patients with hypogammaglobulinemia. Detection of IgE antibodies to IgA. N Engl J Med 1986; 314:560-564. Sekul EA, Cupler EJ, Dalakas MC. Aseptic meningitis associated with high-dose intravenous immunoglobulin therapy: frequency and risk factors. Ann Intern Med 1994; 121:259-262. Kato E, Shindo S, Eto Y, et al. Administration of immune globulin associated with aseptic meningitis. JAMA 1988; 259:3269-3270. Casteels-Van Daele M, Wijndaele L, Hunninck K. Intravenous immunoglobulin and acute aseptic meningitis. N Engl J Med 1990; 323:614-615. Scribner C, Kapit R, Philips E, Rickels N. Aseptic meningitis and intravenous immunoglobulin therapy. Ann Intern Med 1994; 121:305-306. Arnon SS, Schechter R, Maslanka SE, Jewell NP, Hatheway CL. Human botulism immune globulin for the treatment of infant botulism. N Engl J Med 2006; 354:462-471. Arnon SS. Creation and development of the public service orphan drug Human Botulism Immune Globulin. Pediatrics 2007; 119:785-789. Long SS, Gajewski JL, Brown LW, Gilligan PH. Clinical, laboratory, and environmental features of infant botulism in southeastern Pennsylvania. Pediatrics 1985; 75:935-941. Schreiner MS, et al. Infant botulism: a review of 12 years' experience at the Children's Hospital of Philadelphia. Pediatrics 1991; 87:159-165. Wilson R, et al. Clinical characteristics of infant botulism in the United States: a study of the non-California cases. Pediatr Infect Dis 1982; 1:148-150. Anderson TD, et al. Airway complications of infant botulism: ten-year experience with 60 cases. Otolaryngol Head Neck Surg 2002; 126:234-239. Arnon SS. Infant botulism. In: Textbook of Pediatric Infectious Diseases. 5th ed. Philadelphia: WB Saunders 2004; 1758-1766. Snydman DR, Werner BG, Tilney NL, et al. Final analysis of primary cytomegalovirus disease prevention in renal transplant recipients with cytomegalovirus immune globulin: comparison of the randomized and open-label trials. Transplant Proc 1991; 23:1357-1360. Tseng-Ong L, Mitchell WG. Infant botulism: 20 years' experience at a single institution. J Child Neurol 2007; 22:1333-1337. Underwood K, Rubin S, Deakers T, Newth C. Infant botulism: A 30-year experience spanning the introduction of botulism immune globulin intravenous in the intensive care unit at Childrens Hospital Los Angeles. Pediatrics 2007; 120:e1380-e1385. Siber GR, Syndman DR. Use of immune globulins in the prevention and treatment of infections. Curr Clin Top Infect Dis 1992; 12:208-256. Berkman SA, Lee ML, Gale RP. Clinical uses of intravenous immunoglobins. Ann Intern Med 1990; 112:278-292. Bossell J, et al. Safety of therapeutic immune globulin preparations with respect to transmission of human T-lymphotropic virus type III/lymphadenopathy-associated virus infection. Morb Mortal Wkly Rep 1986; 35:231-233. Wells MA, Wittek AE, Epstein JS, et al. Inactivation and partition of human T-cell lymphotrophic virus, type III, during ethanol fractionation of plasma. Trans 1986; 26:210-213. Horowitz B, Wiebe ME, Lippin A, Stryker MH. Inactivation of viruses in labile blood derivatives. I. Disruption of lipid-enveloped viruses by tri(n-butyl)phosphate detergent combinations. Transfusion 1985; 25:516-522. Edwards CA, Piet MPJ, Chin S, Horowitz B. Tri(n-butyl) phosphate/detergent treatment of licensed therapeutic and experimental blood derivatives. Vox Sang 1987; 52:53-59. Paton JC, Lawrence AL, Steven IM. Quantitation of Clostridium botulinum organisms and toxin in feces and presence of Clostridium botulinum toxin in the serum of an infant with botulism. J Clin Microbiol 1983; 17:13-15. Rizk A, Gorson KC, Kenney L, Weinstein R. Transfusion-related acute lung injury after the infusion of IVIG. Transfusion 2001; 41: 264-268. NDC 68403-1100-6, 100 mg ± 20 mg lyophilized immunoglobulin single-dose vial individually packaged in a carton, supplied with 2 mL Sterile Water for Injection USP for reconstitution. Store the vial containing the lyophilized product between 2° and 8°C (35.6° to 46.4°F). Do not store BabyBIG in the reconstituted state. Use reconstituted BabyBIG within 2 hours. Do not use beyond expiration date, and dispose unused product in accordance with local requirements. Discuss the risks and benefits of BabyBIG use with the patient's legal guardians, including the possibility of adverse reactions, e.g., hypersensitivity reactions such as anaphylaxis, as well as aseptic meningitis, TRALI, hemolysis, renal failure, and thrombosis [see WARNINGS AND PRECAUTIONS (5)]. Inform patient's legal guardians that BabyBIG is made from human plasma and may contain infectious agents that can cause disease. While the risk of transmitting an infection has been reduced by screening plasma donors for prior exposure, testing donated plasma, and inactivating or removing certain viruses during manufacturing, the patient's guardian should report any symptoms that concern them [see WARNINGS AND PRECAUTIONS (5.3)]. Inform patient's legal guardians that BabyBIG may interfere with immune response to live viral vaccines (e.g., MMR) and instruct them to notify the healthcare provider of this potential interaction when the patient is to receive vaccinations [see DRUG INTERACTIONS (7)]. Store between 2°C and 8°C (35.6°F and 46.4°F).